Are you a breakfast person? Do you dream about Sunday brunch even if you're sitting at work on a Monday afternoon? Then you are going to love this recipe. These made-from-scratch waffles offer so much more than your typical waffle recipe made with flour, eggs, sugar, etc. 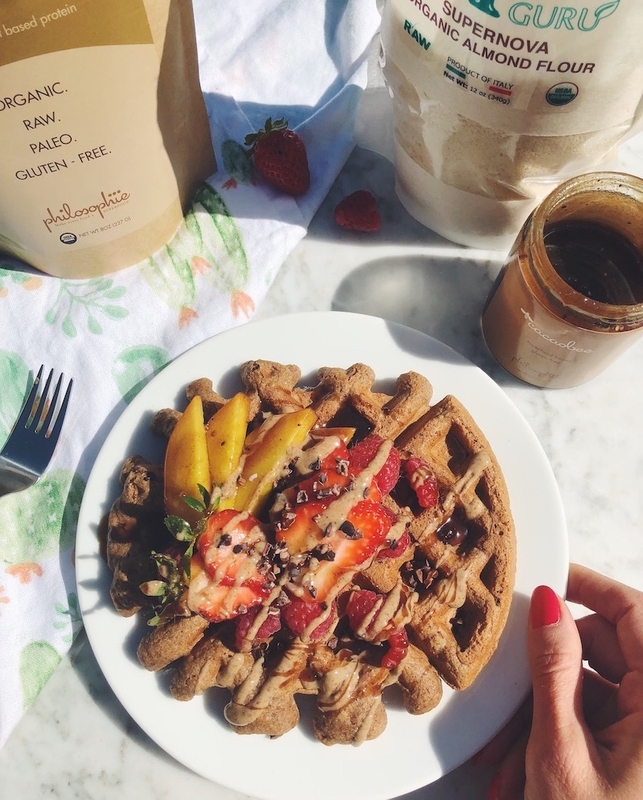 They're wheat-free and gluten-free, dairy-free, refined sugar-free, have superfoods hidden within (we're talking hemp protein, cacao, and reishi mushroom...yep, not exactly your mama's waffles...), and the best part? They kind of taste like chocolate brownies. We're thrilled to team up with Philosophie Superfoods for this recipe. We absolutely love this fellow superfood company and their commitment to creating the highest quality organic, minimally processed, nutrient-rich products, and we also love their goal of helping #MakeEveryFoodASuperfood. They certainly helped us achieve that with these waffles! We used their Cacao Magic superfood powder to add a hefty dose of plant based-protein, antioxidants, and of course, that rich chocolatey flavor we were going for. Chocolate for breakfast? We'll take it! 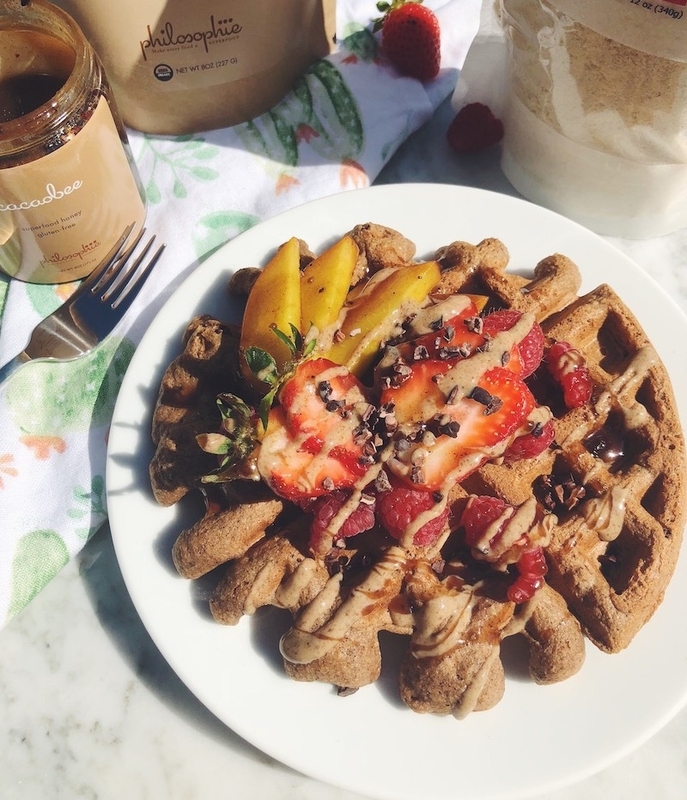 Instead of maple, we used a drizzle of their superfood-infused Cacao Bee Honey + our Dastony Sprouted Almond Butter which made this entire brunch situation pretty next level. If you're avoiding gluten and grain-based flours RawGuru Supernova Blanched Almond Flour will be a game changer for you. This lightweight flour has just one ingredient - Sicilian Supernova Almonds - and is the perfect grain-free replacement for traditional flour in a variety of recipes. We're talking cookies, brownies, bread, crackers, muffins, scones, pancakes and yep, waffles. Not only is this flour incredibly versatile, but almonds are recognized by many health professionals and nutrition experts as one of the most optimal foods for human consumption. Almonds offer a great source of plant-based protein, have plentiful fiber, are rich with heart-healthy monounsaturated fats and offer antioxidant protection with their high level of Vitamin E. They also offer key trace nutrients such as magnesium, manganese, copper, vitamin B2 (riboflavin) and phosphorus. Blanched almond flour is perfect in waffles, especially if you want a lighter, less-gummy consistency. Time to fire up those waffle irons! 1. Combine dry ingredients in a large mixing bowl. 2. Combine wet ingredients. Whisk egg or flax egg, then combine with almond milk, coconut oil, and vanilla. 4. Ladle the batter onto your preheated waffle iron, and cook until crispy on the outside. Waffles will typically be done when they stop steaming - typically about 5-8 minutes depending on your waffle iron.